Argus crude oil pricing has been entrenched in the world’s global markets since 1979. Our methodologically appropriate and transparent prices have been adopted in a wide range of commercial contracts, official selling prices, internal transfer pricing, tax formulas and economic modelling used by governments and all aspects of upstream, midstream and downstream markets. Our key crude prices, including WTI Houston, WTI Midland, LLS and Mars are used extensively as the settlement basis for exchange-traded derivatives. The Argus Crude service is your must-have source for daily news, prices and analysis for more than 80 different internationally-traded crude streams. The Argus Americas Crude service provides market information and price transparency to the rapidly growing US Gulf coast markets as well as to markets in the US midcontinent, US west coast, Canada, South America and other pricing centres in the Americas. The Argus China Petroleum service offers in-depth daily coverage of oil markets in China, the world’s largest net importer of crude. The Argus Caspian Markets service, available in Russian and English, includes a weekly report on the crude and oil products markets of the Caspian region and central Asia. The Argus Latin Markets service provides an insightful source of news, data and analysis on the Latin American crude oil and refined products sectors. The Argus Nefte Transport service, available in both English and Russian, covers logistics for the exports of oil cargoes each month from the former Soviet Union. The Argus West Africa Oil service brings clarity to previously opaque west African crude oil and refined products markets and includes daily prices for 27 regionally produced west African crude grades. The Petroleum Argus service is our flagship business intelligence service with an international reputation for providing thought-provoking and independent analysis of the global oil and gas markets. 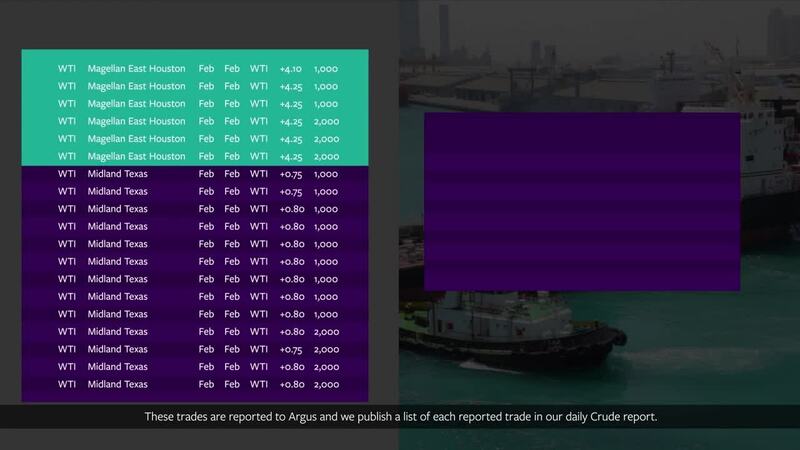 Drawing on Argus’ daily oil price reporting expertise, this service features intelligent, independent coverage on derivatives, arbitrage, market fundamentals and global trading. Our daily forward curves are built from unbiased and transparent industry-specific methodologies that produce representative market values free from distortion for Asia-Pacific, American or European crude exposure. Argus regularly creates free presentations on subjects relevant to the international energy markets, giving you the chance to get additional in-depth analysis from our in-house subject matter experts. See which webinars are related to your interests. Half of Argus' employees are commodity journalists who specialise in reporting news and price information relating to physical energy and related commodity markets. Explore our free news stories shared from journalists around the globe. We are dedicated to covering crude oil markets around the world, and our services will help you find the prices and news you need to track the industry. We have offerings in English and Russian, while our deep understanding of downstream markets enables us to put crude oil into context within the larger energy landscape. We invite you to explore our services and see which one may best fit your business. Our conferences and events around the globe bring together the top minds and managers from various commodity sectors. Join us and gain exclusive insight into commodity markets. Argus Consulting Services, part of the Argus Media group, is the research and consultancy division of Argus. We provide clients with customised analysis, research, data and commentary services on international commodity markets.